According to the Sun Safety Alliance, August is one of the months when the suns rays are most intense. And that can spell disaster for our skin, outdoor furniture and lawns. Thats why wed like to remind everyone to seek cover under our mesh shade tarps or sun shade sails whenever possible. At this point, you may be curious as to why August tends to be one of the worst times of the year to be caught without a shade tarp. Simply put, during the month of August the earths axis is severely tilted. As a result, the suns rays are more concentrated and dont have to travel far to reach the ground. Hence why we make sure that our mesh shade tarps are designed to keep up to 75% of the suns UV rays at bay. Our sun shade sails, on the other hand, will stop much more than that. In our experience, theyll prevent up to 90% of the rays from reaching the ground. Given how intense the rays are, thats an excellent start. But we wouldn’t suggest stopping there. Although there is no doubt that our mesh shade tarps and sun shade sails are very effective at blocking the suns rays, it doesn’t take much for sunburns and other related problems to arise. So we would like to encourage everyone to take additional precautions as well. For example, try and cover outdoor furniture with UV resistant tarps before and after use. Putting them underneath of our mesh shade tarps and sun shade sails is obviously advisable too. Taking both actions will help prevent the paint and fabrics from fading. It should also help minimize the deterioration of any plastic furniture. As for lawns and plant life, water them during the early evening hours and consider putting them underneath of a mesh shade tarp during the hottest parts of the day. Such actions should reduce incidents of burnt leaves and wilting stalks. To learn more about how our mesh shade tarps and sun shade sails can help everyone get through the hottest days of August in comfort and style, please contact us. This entry was posted in shade tarps and tagged mesh tarps, shade tarps on July 31, 2014 by CanopiesAnd Tarps. Consider applying for shade structure grants to cover the cost of your desiredshade tarpaulins, party tents and portable carports. There are truly grants available that will cover such portable structures as well as others. Just keep in mind that the fabric involved typically has to be capable of blocking a percentage of the suns rays.One organization that is offering groups up to $8,000 in funds specifically for fabric or other shade installation is theAmerican Academy of Dermatology. Its presently an annual program and you can find application details by contacting the organization directly. There are also playground improvement grants available that may help your community obtain such things as athletic field covers,gazebos, carports, privacy fence tarps, greenhouses and pond liners. The list of financial resources to consider tapping into includes NRPA Out-of-School Time, Lets Play, Finish Line Youth Foundation and the W.K. Kellogg Foundation. Lastly, wed suggest purchasing your shade tarps, tents, gazebos and the like from us. At Canopies and Tarps, we offer organizations quantity discounts, everyday low prices and hot deals. In addition, non-California residents do not have to factor in sales tax. So thats an additional savings to consider. On top of that, we accept a variety of different payment methods that includes company checks, money orders, PayPal and credit cards.For additional information about selecting affordable tarpaulins, athletic field covers, tents and more for your communitys playground, pleasecontact usat (877) 811-3911. This entry was posted in shade tarps and tagged mesh tarps, shade mesh tarps, shade tarps on March 21, 2014 by CanopiesAnd Tarps. With warm weather rushing towards us, its time to take a good look at your familys outdoor recreation area. Is it in a spot where your family and friends will be safe from prying eyes and UV rays? Or will they be at risk of encountering peeping Toms and sunburns? If its looking more like the last scenario, nows the time to invest in mesh shade tarpaulins. Mesh shade tarpaulins come in different sizes, colors, shapes and designs. So you should be able to incorporate them into your familys outdoor recreation area with ease. For example, you could outfit your propertys chain link fence or pool cage with a heavy-duty privacy tarpaulin. Each one is made with an arctic flexible, high density polypropylene mesh that is capable of blocking 87% of a peeping Toms view. In addition, the privacy fences feature strong brass grommets every 24 inches. So attaching them to your fence or pool cage should be a quick, straightforward affair. Of course not every peeping Tom will try and watch your family from the ground. Some may also take to the skies with personal drones, binoculars or telescopes. 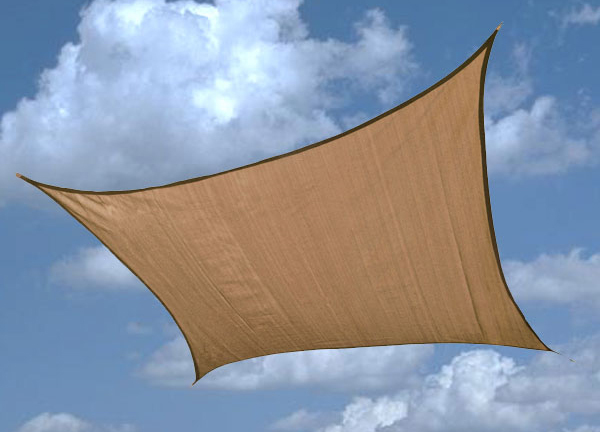 So to keep prying eyes from above at bay, youll want to consider investing in sun shade sails. They are made from a UV stabilized, breathable polyethylene that allows both rain and wind to pass through. 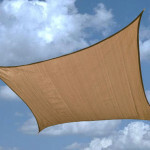 Thus, you wont have to worry about the sun shade sails succumbing to the weather. As a matter of fact, theyll do the exact opposite. The tarpaulins will help to keep your familys outdoor recreation area cool, shady and private. Theyll also block out almost all UVB and UVA rays at the same time. Therefore, your familys risk of developing wicked sunburns will also be minimized. To find out more about mesh shade tarpaulins, please contact us at (877) 811-3911. At Canopies and Tarps, we feature a fine assortment of mesh shade tarpaulins and more. Orders may be made online or by phone and hot deals are currently available. See the hot deals section of our website for code information and save up to $50 off your next tarpaulin purchase. This entry was posted in mesh tarps and tagged mesh tarps, shade tarps, sun shade tarps on March 13, 2014 by CanopiesAnd Tarps.